Thomas Smythe 1825 – 1906. Thomas Smythe was born in 1825, the younger brother of Edward Robert Smythe (1810-1899). They were brought up together in Berners, Ipswich. Little is known about Thomas Smythe’s education, although we can presume that he followed in his brother’s footsteps, studying at the school of Mr R B Clamp in Ipswich. Their father, James Smyth (the ‘e’ was added later in the century) was an accountant at the Bank of Bacon, Cobbold, Durningham and Cobbold in Tavern Street, Ipswich. Thomas undoubtedly worked with his brother, probably sharing pictures in the early years. Around 1845, Edward Robert Smythe left for Bury, and Thomas set up on his own as a landscape and animal painter in Brook Street, Ipswich. Indeed it was in Brook Street that he painted his finest pictures. At this time he also married Miss Pearse. Besides canvas Thomas Smythe worked with wood panel and prepared painting boards. Some of these beautifully executed works (which have an almost enamel-like quality) are highly sought after today. During this period Smythe produced many delightful pairs of paintings and quartets illustrating the Seasons. In recognition of his flourishing career the Ipswich Art Society awarded him a Silver Medal in 1868. In 1876 Smythe visited Cumberland where he executed many paintings of the area, in particular Borrowdale. He visited London in 1898, and sought out the Old Plough Inn, Kensall Green, an old haunt of George Morland. A painting of this subject was exhibited at the Art Society. The following year he moved to London to live with his son and daughter-in-law, and remained there until his death in May 1906. 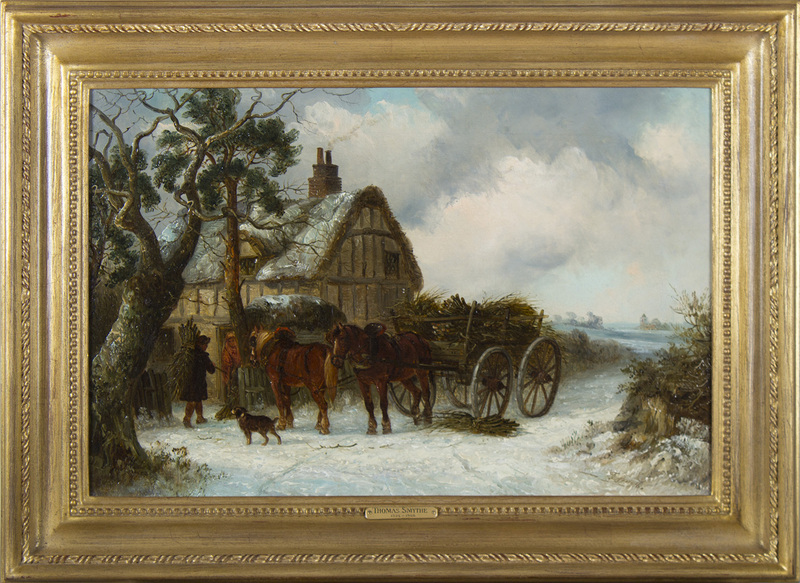 Perhaps more than any other East Anglian painter of the mid 19th century Thomas Smythe captures the spirit of rural England. It is evident in the ‘Cottage Door’ and ‘Going to Market’ scenes which detail the dress of the farmhand or the gig laden with goods. He rendered simple scenes with great feeling. A cottage or a village church is often featured in the distance. 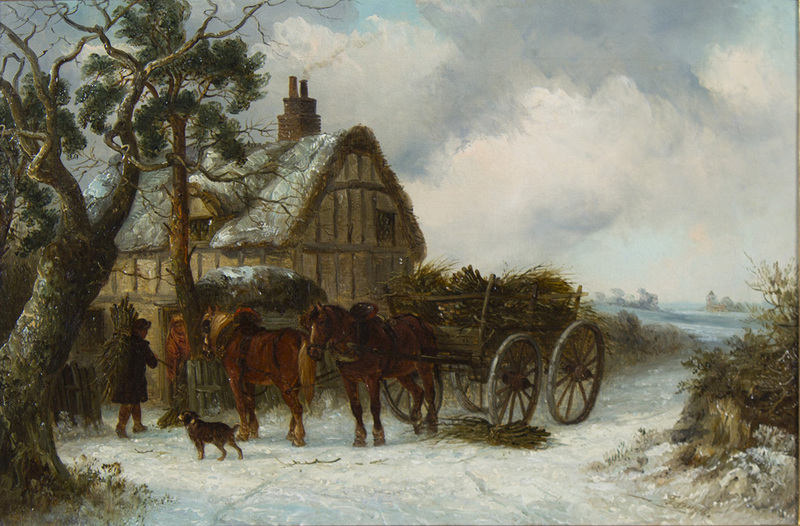 Nor did any other East Anglian painter portray the coldness and beauty of a bleak, snowy winter’s day as Thomas Smythe.